Helping teen girls become real in a fake world! Check out the GREAT review on Amazon.com! Head-to-Soul Makeover featured on ConversantLife! Hi! 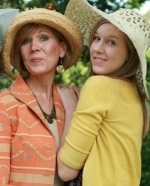 I’m Shelley, and my daughter Heather and I were having fun with hats at a mother-daughter tea with her high school small group. It was for that group that I originally wrote Head-to-Soul Makeover. I wanted a way to teach the girls the same principles as in the book I co-authored for women, Character Makeover. If you want to know more about me, come visit www.shelleyleith.com. I’d love to hear from you!